Photo taken at Senita Basin in Organ Pipe National Monument, Pima Co., Arizona. RANGE: Restricted distribution In Arizona. Found in just a few locations close to the Mexican border within Organ Pipe National Monument. Widespread in Sonora, Mexico. 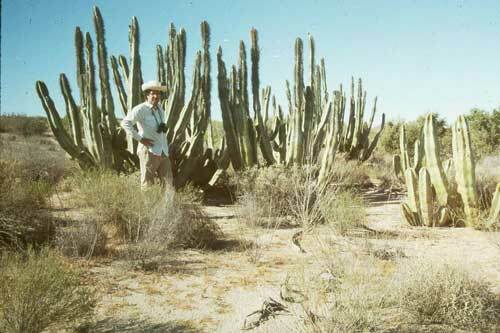 BRANCHING: Like Organ Pipe Cactus, Senita Cactus branches mostly at ground level. The stems have fewer vertical ribs (usu. 7 to 9) leaving smooth green tissue exposed between them. SPINE CLUSTERS: Starting at about 1½ meters above ground level spine clusters include numerous, long, bushy, hairlike spines. These dense spines apparently protect flower buds, flowers and fruits. In the region below the hat of hair-spines (pseudocephalium) the spine clusters consist of ten or so short, thick spines. FLOWERS: The relatively large flowers are white-pinkish in color. FRUIT: The nearly spherical fruit is red at maturity, but less than 3 cm in diameter, closely guarded by dense spine clusters.